Welcome to the documentation for Macrofocus Treemap. The "Getting Started" chapter provides a brief introduction to the most important features of the application and is a good place to start for new users. All of the features are explained in detail in the subsequent chapters. If you don’t find what you are looking for in these pages, then you might want to look at our FAQ list, and of course you may also contact TreeMap support. This chapter introduces the core features of Macrofocus Treemap and is intended to help new users get started with analyzing their data. The data that is used in this chapter. 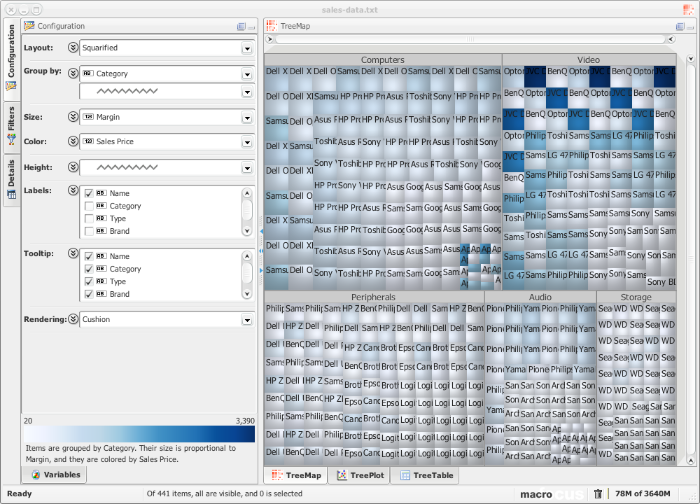 Macrofocus Treemap can load data in many different formats. For our example, we chose a simple text format where the data values on a line are separated by Tab characters. This creates the least problems with special characters in the data values, is human-readable, and can be exported by all the common data tools. The file can be opened by selecting the File › Open…​ menu. The dialog for loading data. The data is then loaded and displayed with default settings. A first rough view of the data with the default settings. In a first step we want to limit our analysis to one year and one sales region. We therefore need to filter out the rest of the data. This can be done in the Filters panel that can be activated by clicking on the "Filters" tab along the top left of the application window. At the bottom of the Filters panel we find the two controls for Region and Year. Make sure that the "Hide filtered" check box is checked, so that the filtered-out items are removed from the visualization. Applying filters to show one year and one region. By default the data is grouped by the first categorical variable that is found in the data, in this case “Category”. We can add a second level of hierarchy to also show the grouping of product types within the product categories. Grouping products by product category and type. Now we turn our attention to the size and color of the rectangles. We are interested in how well the products sell in the various categories and therefore map the size of the rectangles to the variable “Revenue” and their color to “Units Sold”. The largest revenue is generated by the “Video” category, more specifically the televisions. One of the TVs sells much less units than the others but still produces comparable revenue. Products of type "MP3" sell the most units, in particular one of them, but the tablets and hard drives also have one top seller. Peripherals don’t contribute much to revenue, but there are many different products in this category that must be managed. Size and color mapped to “Revenue” and “Units Sold”. The labels in the rectangles with the product names are a bit verbose and clutter the visualization. We change this so that the label only shows the "Brand". 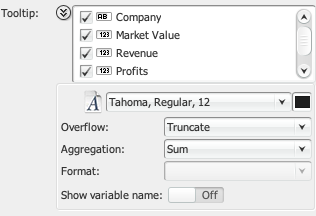 In return, we modify what is shown in the tooltip and choose "Name" as well as all the numerical variables. This way, the full information is shown in the tooltip that opens up as we move the mouse pointer over the rectangles that we want to investigate. Defining labels and tooltip content. We want to further analyze the "Peripherals" category as there are many products in that category but the revenue is rather low. 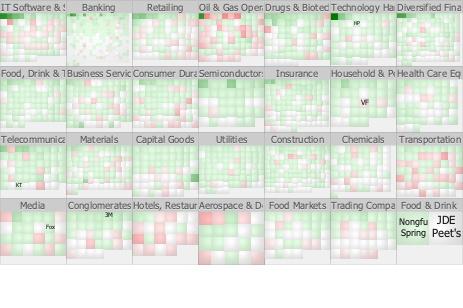 One way to zoom in is to use the mouse wheel or the range sliders along the top and right sides of the treemap view. While this is a quick way of making things larger, it is not optimal, as it is a purely geometrical zoom that does not take the aspect ratio of the target into account. Zooming on a region of interest. A better way of focusing on a sub-region is to drill down by double-clicking on the group rectangle of interest (double-click again to drill back up, or use the context menu by right-clicking anywhere). That group is then laid-out again in an optimal way. Drilling down into a category. Now the range of the colormap needs to be adjusted to the visible data. The highest value within "Peripherals" seems to be about 250 units sold, and so we set this as the maximum range in the options panel for the color. Adjusting the range of the colormap to the visible data. And now for something completely different: let’s find out which brand sells what kind of products. For this we choose a circular layout, because it communicates the groupings more intuitively. The items are colored by product category, and their size is proportional to the margin of a product. 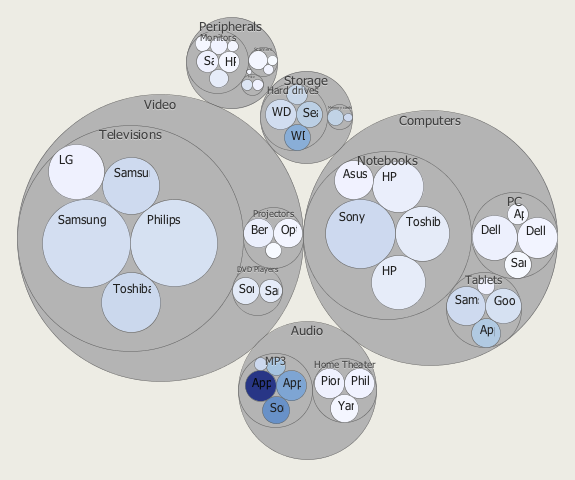 We can see that Samsung, Sony, and Philips have a diverse range of products. The margins are highest for computers, except for Apple that seems to be different. Using a circular layout to analyze brands. 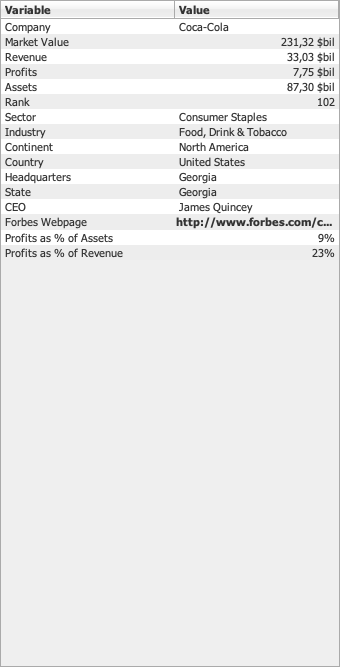 The "profit" variable measures the profit based on revenue, i.e. revenue * products sold. There is no variable that measures profit per product, i.e. price * margin. We can easily add such a variable by using the "Variables" panel at the bottom of the "Configuration" panel. Adding a new variable from a combination of existing variables. Now we can map the new variable to size and see for example that there is in particular one projector where the profit per unit sold is very high. We remove the "cushion" effect and switch to flat rendering to obtain a cleaner look. Flat rendering looks cleaner, but maybe less attractive. The items are colored by units sold, but to analyze the high-profit products, the colormap is not optimal yet, as the outliers in the Audio and Storage sections stretch the dynamic range. We therefore limit the range of the colormap to 350 units sold per year, and assign a special color to all the items that have higher sales. 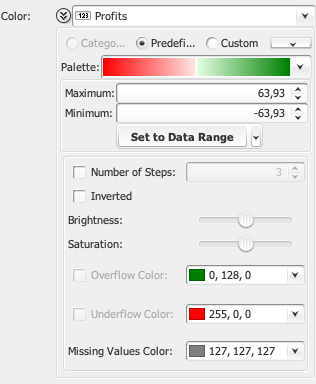 Limiting the range of the colormap and using an overflow color to highlight relevant parts of the data. After all the aspects of the visualizations have been configured, all the settings together with the data can be saved to a compact file sing the File › Save As…​ menu item. The file is saved in a proprietary format with the extension “.mtm”. If you need to export the visualization only, for example to embed it in a presentation, then this can be achieved by using the File › Export Graphics…​ menu item. There is a choice of various pixel- or vector-based graphics formats. A typical dataset describes a series of observations, where each observation is described by a number of attributes. Let’s take for example a store that sells consumer electronics. At the end of a year, each product that the store sells is described by the number of units sold, the price of a unit, and the margin. Also, the products are categorized into categories and types (e.g. peripherals > scanners) and sales are listed by different sales regions. A typical table of data with observations (rows) that are described by variables (columns). Such data is usually represented as a table where each row is an observation, and each column is a variable that describes the observations. The standard way of displaying such data is in the form of charts. Line charts for example can show the relationship between two quantitative variables (e.g. sales vs. time). Bar charts on the other hand can show the relationship between a quantitative and a categorical variable (e.g. sales vs. product category). 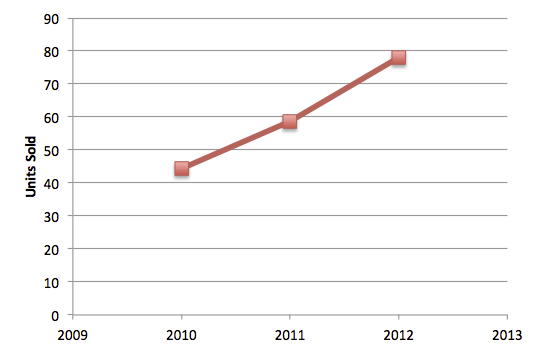 Line chart showing sales over time. Bar chart showing total sales per product category. Often though there are more interesting relationships in the data than can be shown with these standard graphs. The data needs to be grouped by various categorical variables for example, while still showing the relationship between two quantitative variables. In the product sales example from above, we would for instance like to see which product types produced the highest profits, what products these were, and how many units were sold. To achieved this, each product can be mapped to a geometric shape whose size is proportional to the profit of this product, and colored by the number of units sold. The shapes are then nested into each other according to the hierarchy of product categories and types. Figure x shows this where the geometric shapes are rectangles. Each rectangle represents one product. The bigger the rectangle, the larger the profit. the darker the color, the more units were sold. 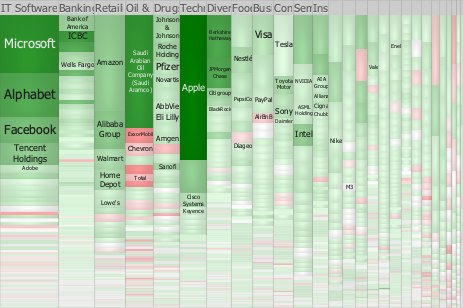 Treemap showing sales (color) and profits (size) for all the product categories and types. 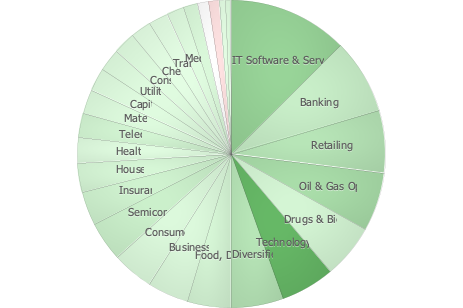 This way of displaying hierarchical quantitative data is called a Treemap. 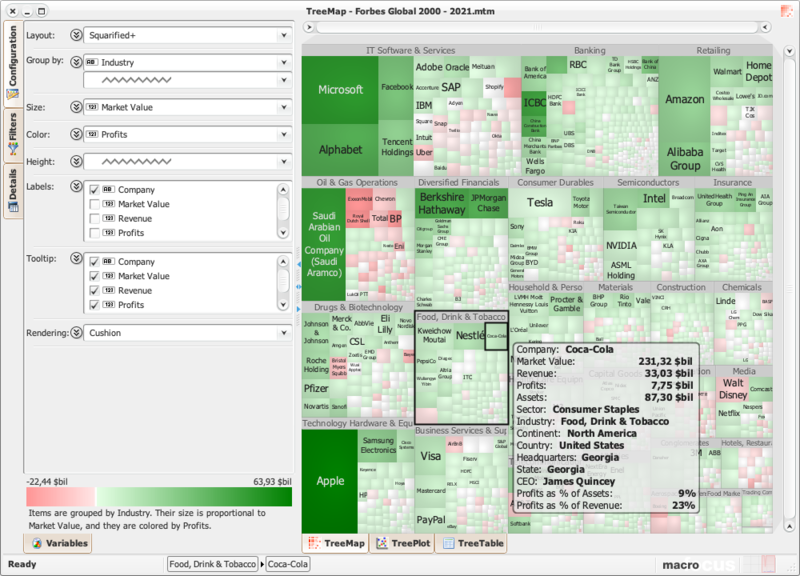 In general, a Treemap is an area-based visualization of hierarchical data using nested rectangles. Treemaps were made popular n the 90s by Ben Shneiderman from the University of Maryland, College Park. 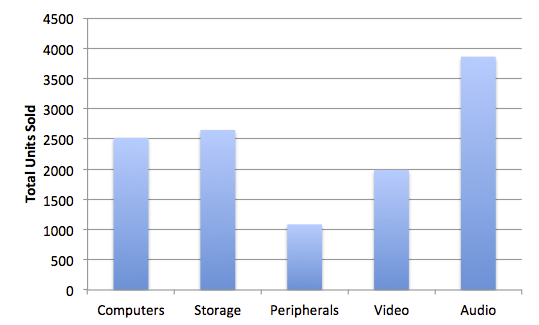 Figure x shows that in the example data set, the largest profits are generated by TVs, followed by notebooks. One of the TVs (LG) sells less units than the others but still generates a good profit. Most units are sold of the "MP3" and "Hard Drive" product types. Alternatively, one can also use circular geometric shapes and nest them. The hierarchical structure of the data thus becomes more apparent. The advantage of treemaps is that space is used efficiently and that the size of the tree nodes directly aggregate up the hierarchy. A circular layout emphasizes the hierarchical structure of the data. 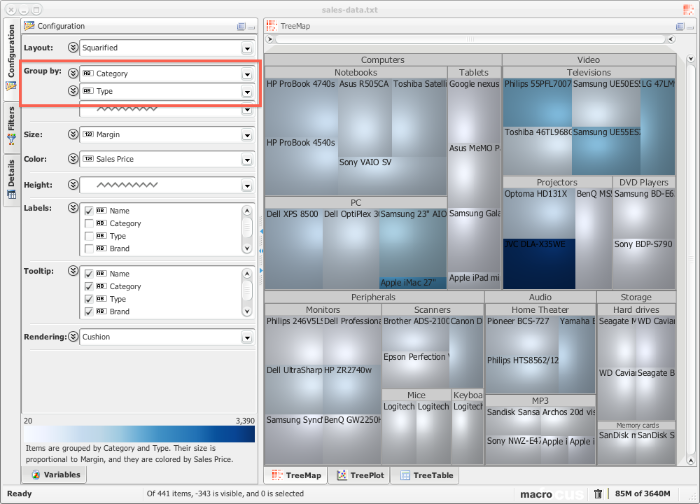 Macrofocus Treemap provides the classic Treemap layout algorithm, but also a range of other layout algorithms in order to find the best visualization for the data and tasks at hand. All the layouts have in common that they map hierarchically structured data to proportionally sized and colored shapes that are arranged in space. The resulting document is ideal for printing or inclusion in a report. It is a vector format and therefore resolution independent. The resulting document is ideal for further editing and for inclusion into another document. It is a vector format and therefore resolution independent. Scalable Vector Graphics (SVG) can be displayed by many web browsers with an embedded SVG viewer, or edited by any application supporting SVG (such as Adobe Illustrator). A common vector format and therefore resolution independent. Can be used for printing. A resolution independent format common on the Windows platform. A raster format. + All the raster export format allow for setting the desired DPI for high-quality output. The comma-separated values (CSV) format stores tabular data (numbers and text) in plain-text form. Most spreadsheet and data management software are able to import data in this format. The tab-separated values format is a popular method of data interchange among databases and spreadsheets. It stores tabular data (numbers and text) in plain-text form. 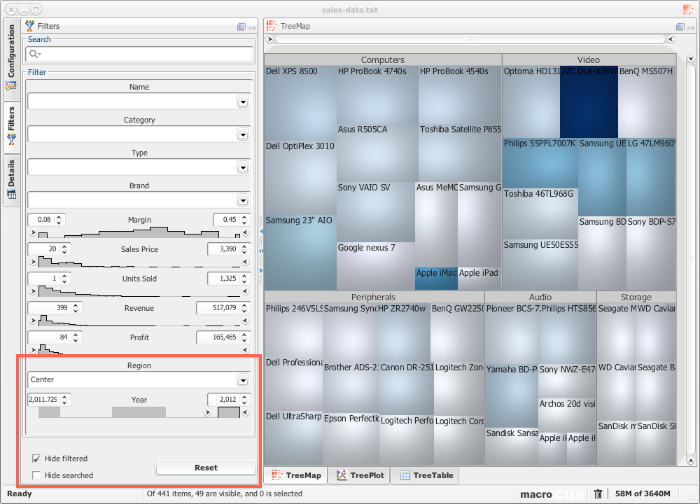 TreeMap offers the possibility of loading data in various formats and from multiple data sources. The most common ways of importing your own data is to use tab-delimited orcomma-separated files, as well asExcel workbooks. Connectivity to common relational databases and some on-line data providers is also provided. or double-click on the file if its extension is registered to TreeMap. This is the native format used by TreeMap. It can be used to store both a copy of the actual data, its original data source, as well as all the configurations made using the TreeMap application. The data are stored in a highly compressed binary format to reduce the file size and all the configuration information in XML format. For a detailed technical specification of the data format, please contact us. Loading data from tab-delimited text files should be pretty straightforward. TreeMap expects the first line to contain the name of each column, using the tab character to separate each column. The tab-separated values format is a popular method of data interchange among databases and spreadsheets. It stores tabular data (numbers and text) in plain-text form. 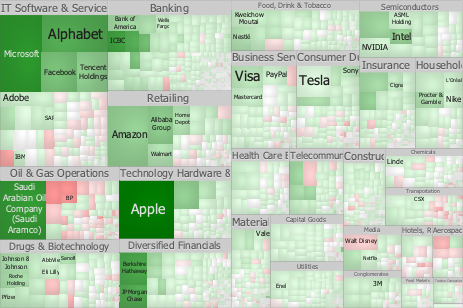 While it is a loosely defined format (even though IANA attempts to standardize it), TreeMap automatically detects its encoding, the type of data values, and handles smoothly all the most common causes of errors. Tab-delimited files are processed similarly to comma-delimited files, except that they use the tabulator character to separate each column. TreeMap expects the first line as a header to contain names corresponding to the columns in the file. These values will be used to name each of the variables. Each record is then located on a separate line. The values between each column are delimited by tabs. 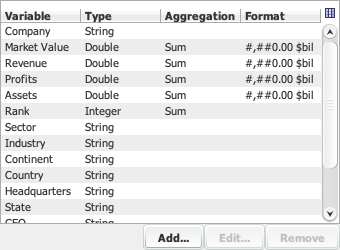 Each record "should" contain the same number of tab-separated fields. Any field may be quoted (with double quotes). Fields containing a line-break, double-quote, and/or tab should be quoted. A (double) quote character in a field must be represented by two (double) quote characters. 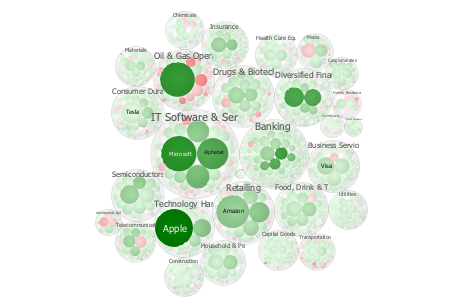 After the file has been loaded, TreeMap will attempt to detect the data type of each column. Automatically recognized types are text (String), numbers (Integer and Double) and some more specialized types such as dates (supported formats are "MM/dd/yyyy", "MM/dd/yy", "yyyy-MM-dd", "dd.MM.yyyy HH:mm:ss"), URLs, geometries (in WKT format), and binary data (in Base64 format). While TreeMap will autodetect the character encoding used for representing international and special characters beyond ASCII characters, it is recommended to use the Unicode standards (typically UTF-8 or UTF-16). To force TreeMap to parse values for a specific data type, an optional second header line can be inserted. The second line can optionally contain information about the type of values to be expected for each column. Possible types are "String" for any type of textual information, "Integer" for numbers without a fractional or decimal component, "Float" and "Double" for single and double precision floating-point numbers, and "Color" to provide color information. Each subsequent lines should contain the respective values for each of the columns. After the data file has been loaded into TreeMap, it will automatically attempt to create a default configuration. The comma-separated values (CSV) format stores tabular data (numbers and text) in plain-text form. Most spreadsheet and data management software are able to export data in this format. While it is a loosely defined format (even though RFC 4180 attempts to standardize it), TreeMap automatically detects its encoding, the type of data values, and handles smoothly all the most common causes of errors. Comma-delimited files are processed similarly to tab-delimited files, except that they use a comma (or semicolon) to separate each column. TreeMap expects the first line as a header to contain names corresponding to the columns in the file. These values will be used to name each of the variables. Each record is then located on a separate line. The values between each column are delimited by commas (or semicolons). Each record "should" contain the same number of comma-separated fields. Any field may be quoted (with double quotes). Fields containing a line-break, double-quote, and/or commas should be quoted. A (double) quote character in a field must be represented by two (double) quote characters. To force TreeMap to parse values for a specific data type, an optional second header line can be inserted. The second line can optionally contain information about the type of values to be expected for each column. Possible types are "String" for any type of textual information, "Integer" for numbers without a fractional or decimal component, "Float" and "Double" for single and double precision floating-point numbers, and "Color" to provide coloring information. Each subsequent line should contain the respective values for each of the columns. TreeMap can read files produced by Microsoft Excel, including the recent Office Open XML format, even without having Excel installed on the local computer. The first row is expected to contain the name of each column. If the workbook contains multiple sheets, a dialog allows to choose which one should be loaded by TreeMap. To force TreeMap to parse values for a specific data type, an optional second header line can be inserted. The second line can optionally contain information about the type of values to be expected for each column. Possible types are "String" for any type of textual information, "Integer" for numbers without a fractional or decimal component, "Float" and "Double" for single and double precision floating-point numbers, and "Color" to provide color information. Each subsequent line should contain the respective values for each of the columns. 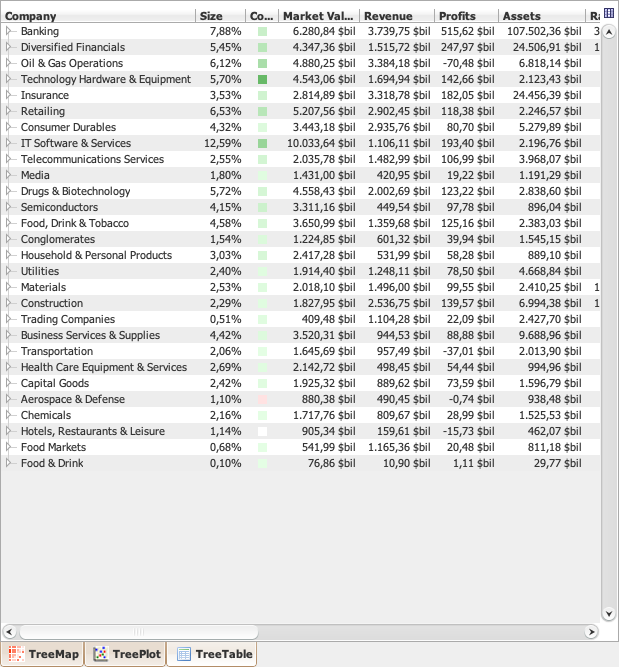 TreeMap can read files in the native OpenOffice and LibreOffice format. 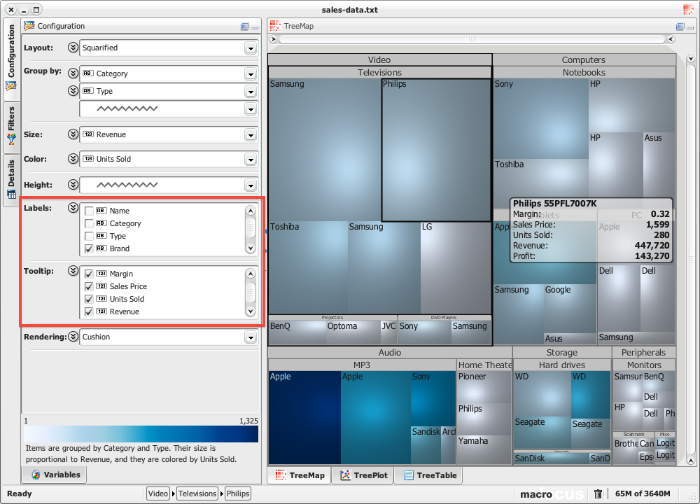 TreeMap can read files in the native SPSS format. 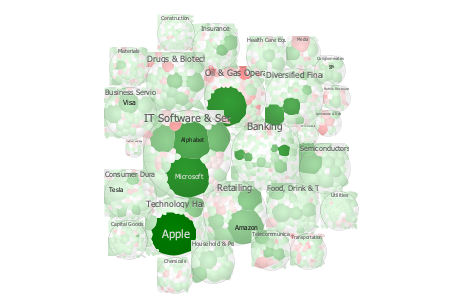 TreeMap can read files in the native SAS format. 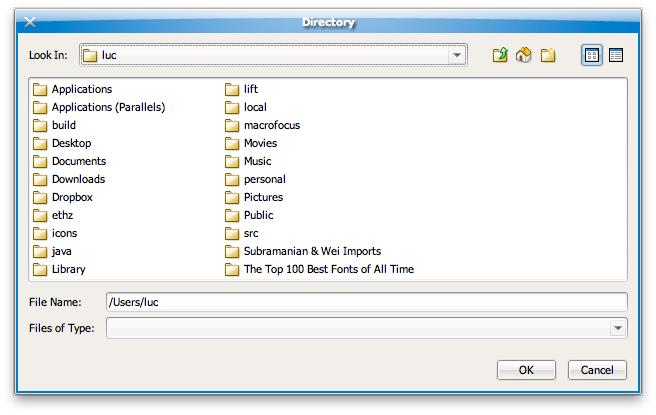 For backward compatibility, files can be loaded in the data format used by the University of Maryland Treemap. A description of the actual data format is provided on the HCIL website. For backward compatibility, files can be loaded in the TreeML file format. A description of the actual data format is provided on the HCIL website. TreeMap can read files in the native Microsoft Project format. Handled identically to the Microsoft Project format. This will analyze the content of the archive, including its hierarchical structure. A typical use is to find which files and directories are taking up space in the archive. Handled identically to the Zip Archive format. 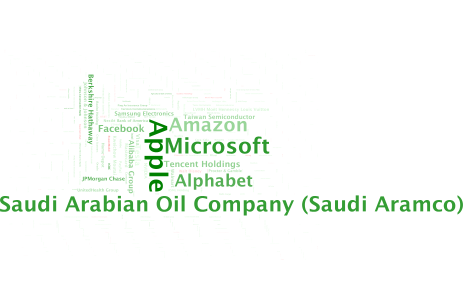 This will analyze the text, compute word count statistics, and open the results as a tag cloud. Handled identically to the Text Document format. 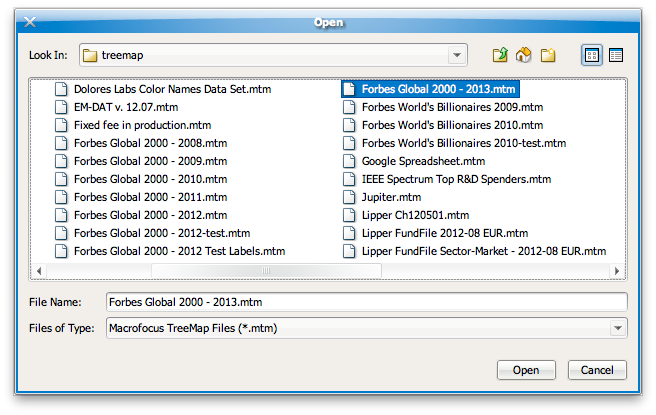 Access database tables can directly be loaded into TreeMap. However, this is only supported on the Windows platform and requires Microsoft Access or the Microsoft Access Database Engine to be installed. Please contact support if your database system is not currently supported. Any data source queryable through a JDBC driver can easily be integrated into TreeMap. Stock quotes data from Yahoo Finance can directly be access through the File › Open Dataset submenu, as well as all the example datasets provided on our website. This menu entry also provides integration withTreeMap Server. 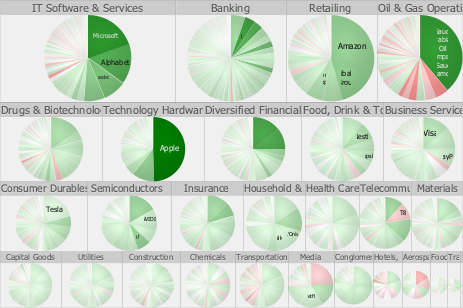 By default, TreeMap automatically assigns the first categorical variable to the label, the second categorical variable (if available) to the grouping, the first numerical variable to the size, and the second numerical variable (if available) to the color. The Byte data type is an 8-bit signed two’s complement integer. It has a minimum value of -128 and a maximum value of 127 (inclusive). The short data type is a 16-bit signed two’s complement integer. It has a minimum value of -32,768 and a maximum value of 32,767 (inclusive). The Integer data type is a 32-bit signed two’s complement integer. It has a minimum value of -2,147,483,648 and a maximum value of 2,147,483,647 (inclusive). For integral values, this data type is generally the default choice unless there is a reason (like the above) to choose something else. This data type will most likely be large enough for the numbers your program will use, but if you need a wider range of values, use Long instead. The Long data type is a 64-bit signed two’s complement integer. It has a minimum value of -9,223,372,036,854,775,808 and a maximum value of 9,223,372,036,854,775,807 (inclusive). Use this data type when you need a range of values wider than those provided by Integer. 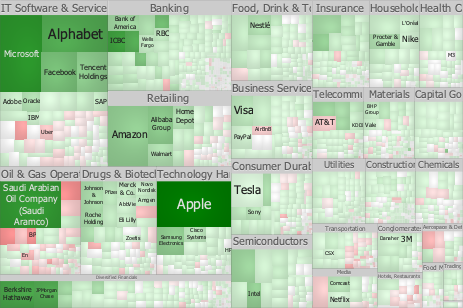 TreeMap possesses a powerful layout, data processing, and rendering engine that offers a vast choice of customization possibilities. 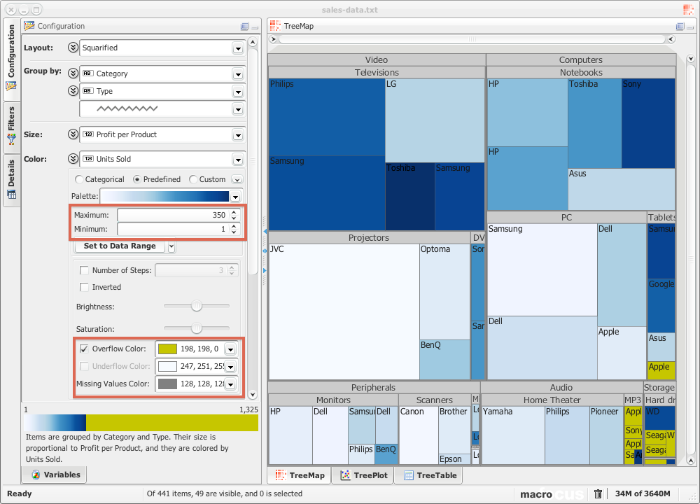 The configuration panel gives instant access to all the key settings, where each section can be further expanded to expose the full palette of choices to fine-tune the appearance of the resulting treemap view. 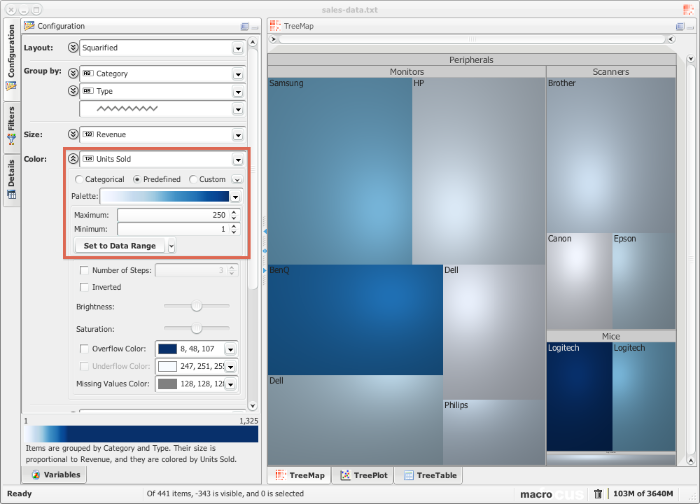 TreeMap offers a full set of the most successful tiling algorithms, which differ in the aspect ratio of the composing shapes, their ability to maintain order, and their stability with respect to changes in the data…​ and of course their readability, performance, and aesthetic properties. 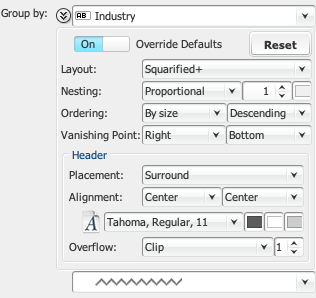 All the settings under Layout can be overridden on a per-variable basis in the Group by pane. The Binary Tree tiling should be considered when the layout stability is extremely important. While not having shapes with very good aspect ratios, it is very stable when changes occur in the data. Invented in 1991, this was the first treemap layout algorithm. Its biggest problem being poor aspect ratios, the tiling becomes less useful for large datasets or screen real estate. For each level, the layout direction is changed between horizontal and vertical, and the display is proportionally divided amongst the children. This is a variation of the Squarified layout algorithm, and differs because the layout direction is fixed from the start. One of its key strengths, other than its natural tiling that produces excellent readability, is that it is ordered and can therefore have its content organized in a predictable way. Being a partially ordered algorithm, the readability is better than the Squariﬁed treemap, although not as good as the Strip layout, which follows a simple linear pattern. 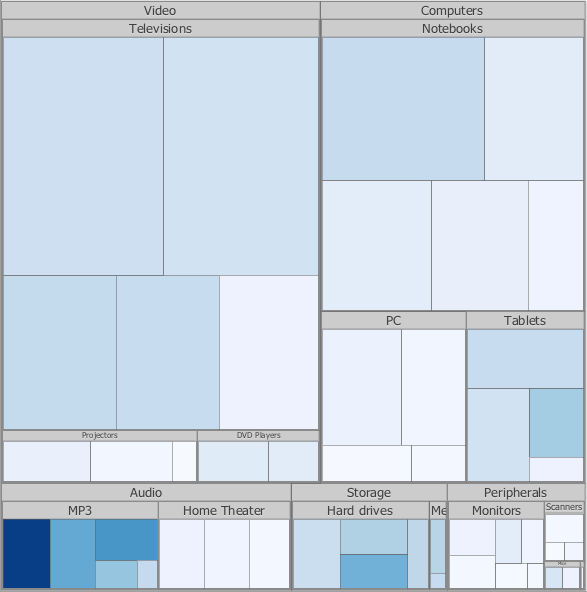 This algorithm tries to satisfy the dual goals of a good aspect ratio for the rectangles, and minimal changes to the order of the items in the treemap. While a bar chart makes no attempt to fill the available space, as this is the case for all the treemap layouts, the length of the bars are proportional to the values they represent. It is nevertheless very useful when then sizes need to be compared visually or when dealing with time series. + Stacked bar charts can be created by combining this layout with the slice layout. The circular layout uses nested circles. While the representation is very attractive from an aesthetic standpoint, it doesn’t fill the available space completely and the size of the groups cannot be accurately compared. A pie chart is a circular chart divided into sectors. The arc length, and consequently the area, is proportional to the quantity it represents. While being controversial, pie charts are very widely used in the business world and can be used effectively for small number of items or when nested inside a circular layout. The Voronoi layout algorithm uses polygons instead of rectangles, resulting in good aspect ratios and an appealing organic look. The matrix layout decomposes the space into equally sized squares. Note that is doesn’t take into account the Size that has been specified. This option allows to set the order in which the items should be laid out. Only ordered layouts will fully honor this setting (in particular the Slice-and-dice and Strip layouts). The smallest shape can be horizontally placed at the left, center, or right of the group and vertically at the top, center, or bottom of the group. This setting currently only applies to the Squarified layout algorithm. The following algorithms produce exact layouts where the size of the item is exactly proportional (at the pixel level when displayed on the screen and accuracy > 99.999999% when zoomed or exported to vector format) to its corresponding area when comparison are made within a group or if the layout doesn’t have any hierarchy (i.e. no Group by defined). Comparisons can also be made across and with other groups (i.e. everything is comparable) with all the above layouts when Nesting is set to None and Header Placement not set to Surround. When Nesting is set to Proportional, areas are comparable between items at the same hierarchy level only. When Nesting is set to Fixed, areas are only comparable within a group. Indeed a small bias is introduced but is in practice negligible. When Header Placement is set to Surround, areas are only comparable with a group. However, TreeMap attempts to size the label of the surrounding group so that the bias is in practice negligible. For the Nesting and Header Placement strategies mentioned above, the additional space used around the group is "removed" proportionally of the contained items. The Pivot by Split Size layout algorithm can potentially introduce errors of ± 2%. With Circular layouts, only the size of the items at the lowest hierarchy level can be accurately compared, and this can be done across groups. The size of groups cannot be compared as the layout is not space filling. While the Voronoi algorithm normally produce layouts of a good quality, it relies on some stochastic optimization methods that will therefore only produce an approximation. Inaccuracy of ± 2% should be expected and some items that are too small may be removed from the resulting layout. The "Group by" drop-down lists allow aggregating data into multiple levels of hierarchy. 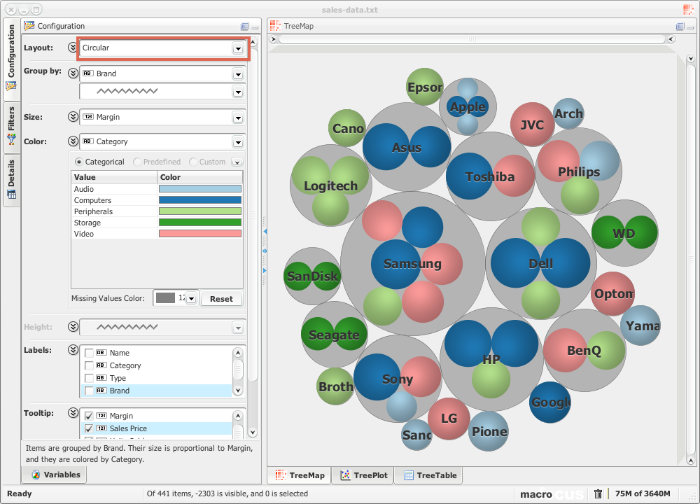 By specifying one or more categorical variables, the resulting TreeMap view will be organized into nested areas, giving the possibility to visually assess how big is a group in relation to another one. Therefore, the sequence of variables (from top to bottom) corresponds to groups, sub-groups, sub-sub groups, etc (e.g. Continent, Country, Region, …​). Only categorical variables and numerical variables with non-unique values can be used for grouping. Common settings can be defined and applied to all the grouping variables that do not override the defaults, or if enabled the settings can be defined on a per group by variable basis. Will reset all the settings to their defaults. Override the default layout for each group by level. See the Layout section for a description of each layout algorithm and Mixing layouts for some examples. 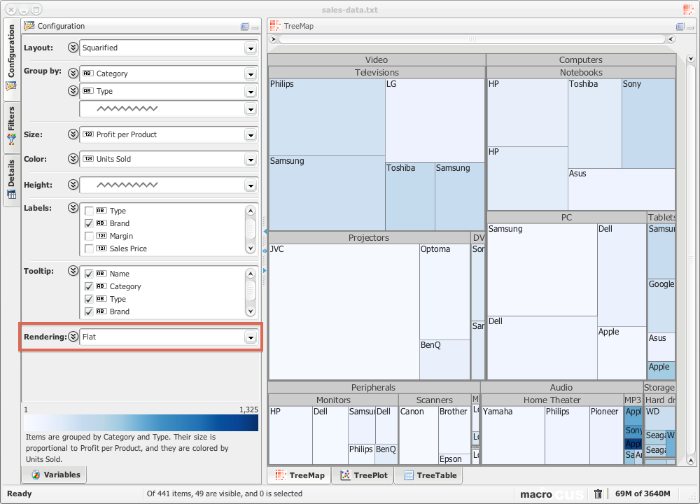 Nesting allows to place gaps around each group of shapes in the resulting treemap view. 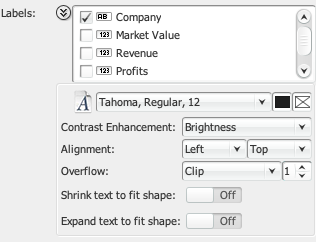 Specify the color of the background of the nested area. Placement allows to control whether labels for enclosing groups should be displayed above or overlaid over the items composing the group. Surround will place a header above each group. The label can be horizontally placed at the left, center, or right of the shape. The label can be vertically placed at the top, center, or bottom of the shape. Used to specify the font family, style, and size to be used for displaying the label. Specifies the color of the text of the label. A shadow effect can sometimes help make the text stand out better. If a color is specified here, this enables the effect. The default is Gray, indicating the effect is enabled. Specify the color of the background of the header. If there is not enough room to display the full label and the display can accommodate less than the specified minimum number of characters to display, then the label is omitted. 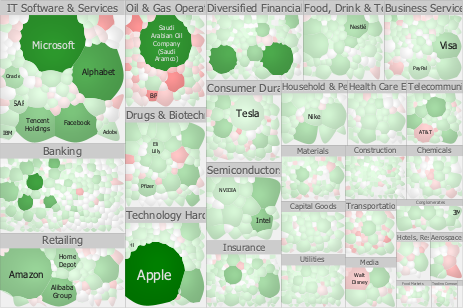 In practice, truncated labels that are too short to allow the viewer to guess its content can clutter up the treemap without adding useful information. If there is not enough room to display the full label, and the display can accommodate less than the specified minimum number of characters to display, then the label is omitted. 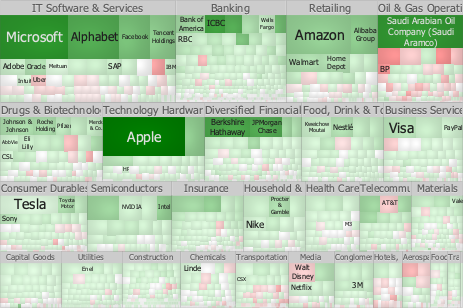 In practice, truncated labels that are too short to allow the viewer to guess its content can clutter up the treemap without adding useful information. 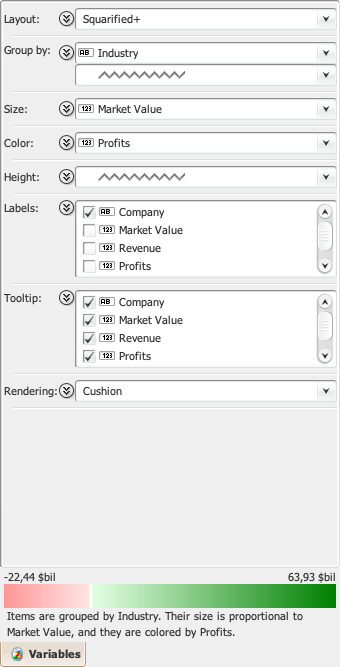 The drop down list tied to the "Size" pane shows the list of numerical variables that can be used to control the size of the shapes. The areas of the shapes will be proportional to the corresponding values, where high values result in a large area, and low values in a small area. 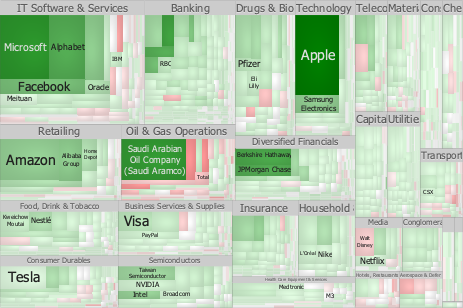 Having no variable selected will result in a TreeMap view composed of objects of equal areas. Common settings can be defined and applied to all variables that do not override the defaults, or if enabled the settings can be defined on a per variable basis. This option is only enabled when one or more Group by variable has been selected. By default, TreeMap uses the Absolute Value if the variable contains negative numbers. Choose Original to have negative values removed from the display, Inverse to have high values correspond to small shapes and small values correspond to large shapes, or another logarithmic scale if only the order of magnitude is of interest. 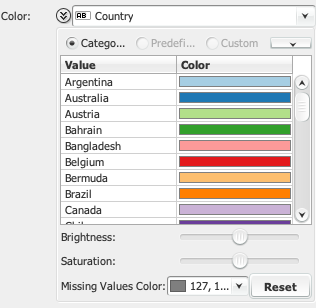 If a numerical variable is selected, TreeMap offers the possibility of setting the lowest and highest values that should be mapped to the selected colormap. If the variable contains negative values, the range is automatically made symmetric. 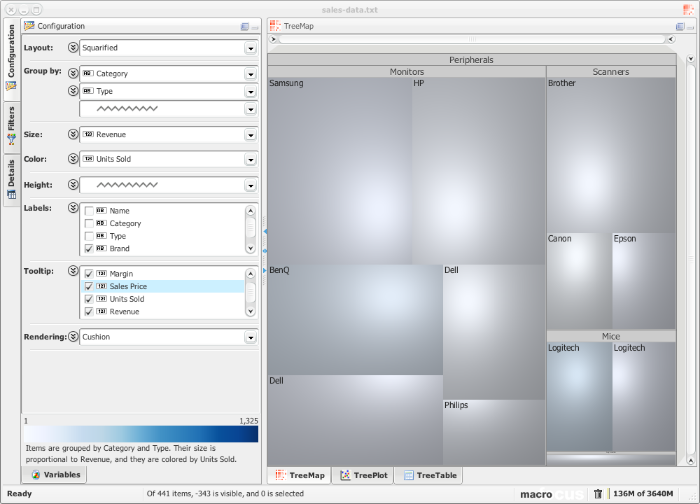 For more customization possibilities, it is also possible to define a custom colormap by setting thresholds at given values. 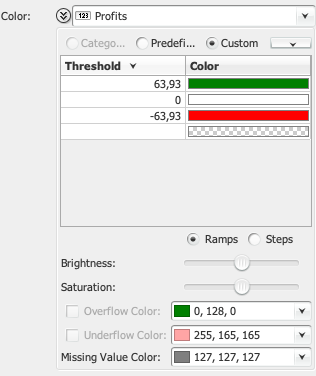 TreeMap will take care of interpolating the colors if Ramps mode is selected, or will make them valid for the whole range in Steps mode. Allows to control the variable that is used for the 3rd dimension, i.e. to have the shapes elevated above the ground plane proportional to their value. Setting the height is only possible if a layout using rectangular shapes is being used. Otherwise, it is disabled. Defines the maximum height as a proportion of the treemap view dimension. The Labels list allows to select which variable should be displayed inside each shape. Multiple labels can be specified and will be displayed line-by-line, and their appearance can be customized individually. The labels will be cut or not displayed at all should the area be too small. Zooming in or drilling down will make them appear. Both categorical and numerical variables can be used for labeling. Variables can be ticked for their inclusion in the list of variables to be displayed. When no variable is selected, then the settings are applied to all the variables that do not override the defaults. Selecting one individual variable from the list allow to define how it should displayed. Unselecting the currently chosen variable can be done using the Ctrl key. Specifies the color of the text of the label. This color can be automatically adapted to improve readability depending on the background color using varlistentry_title. A glow effect can sometimes help make the text stand out better. If a color is specified here, this enables the effect. The default is None, indicating the effect is disabled. An automatic contrast enhancement scheme can be used to modify the color specified under varlistentry_title so that the color of the text is automatically changed when contrast with the background color is two low and the text therefore unreadable. Controls what to do if there is not enough room to display the label entirely. Possible options are Truncate (…​ is added at the end of label), Clip (the text is just cut), or WordWrap (the text will flow to the next line). The font size will be dynamically adjusted so that the text fills the entire width of the shape. The font size specified in varlistentry_title serves as the maximum font size. The font size will be dynamically adjusted so that the text fills the entire width of the shape. The font size specified in varlistentry_title serves as the minimum font size. Details on demand through pop-ups can be defined by selecting the variables that should compose the tooltip and by customizing their appearance. Variables can be ticked for their inclusion in the list of variables to be displayed in the tooltip. When no variable is selected, then the settings are applied to all the variables that do not override the defaults. Selecting one individual variable from the list allow to define how it should displayed. Unselecting the currently chosen variable can be done using the Ctrl key. Used to specify the font family, style, and size to be used for displaying the entry in the tooltip. Specifies the color of the text of the entry in the tooltip. Controls what to do if there is not enough room to display the tooltip entry entirely. Possible options are Truncate (…​ is added at the end of tooltip entry), Clip (the text is just cut), or WordWrap (the text will flow to the next line). See Aggregation in the Size section. Controls how numerical and date variables should be formatted. See the chapter about how to configure the Variables for a full description of the formatting patterns. If checked, will display the variable name on the right side of the value. More options can be customized in the Rendering pane. Maps can be rendered Flat, or with a pseudo-3D shaded Cushion look that highlights the hierarchical structure. 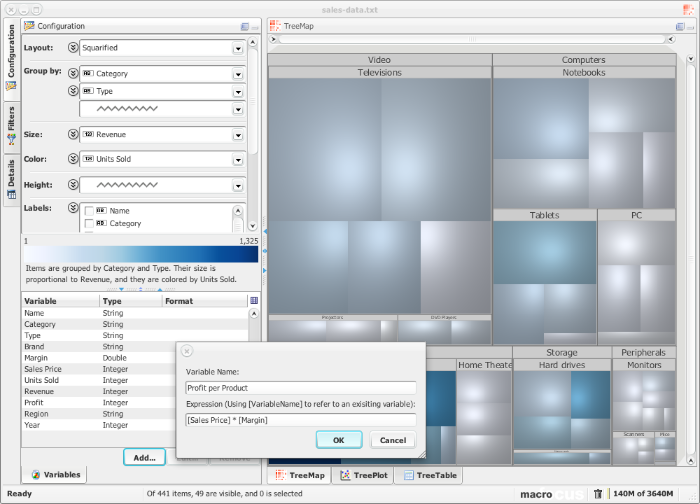 Disabled by default, this option allows to enable the incremental rendering of the treemap. This can be particularly useful for large datasets or layouts with complex rendering options where the standard interaction speed is not fast enough. The depth allows to set how many hierarchy levels should be displayed, allowing to hide the details of sub-elements. 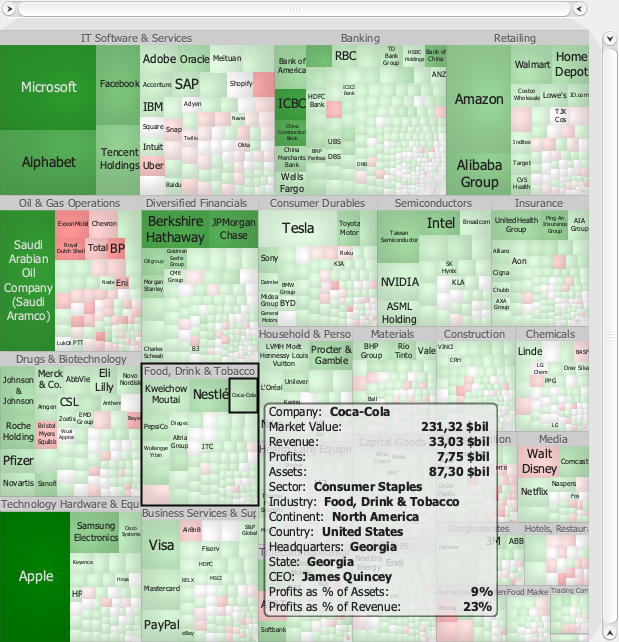 The dimension of the treemap view can be made fixed, typically in the context of visualization made for print or for creating treemaps larger than the actual screen. Allow to parametrize the light source location and intensity used by the Cushion rendering mode. Define the color of the background of the tooltip. If checked, this makes the filtered items be removed from the layout. If unchecked, filtered items will simply not be made visible using their assigned color, but their shape will still be part of the layout. If checked, this makes the items not matching the search criteria be removed from the layout. If unchecked, non-matching items will simply not be made visible using their assigned color, but their shape will still be part of the layout. On the right side of the user interface, you will find the TreeMap view that corresponds to the chosen settings in the Configuration panel. Each item is represented by a colored shape. They will always attempt to fill the available space in an optimal way. 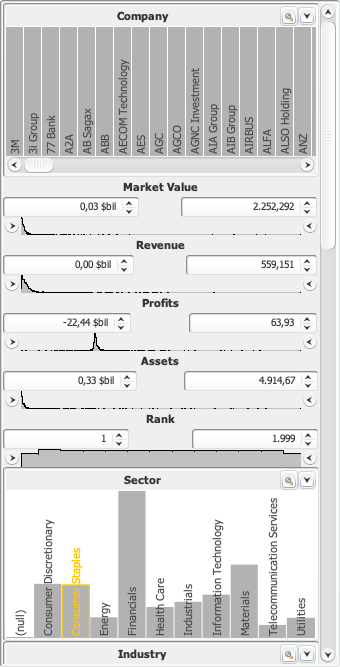 You can zoom into the treemap by using the range sliders on the top and to the right of the display area. You can zoom out by double-clicking anywhere on the slider. Zooming in can also be achieved by using the keyboard and pressing the Page Down key. Correspondingly, zoom out using the Page Up key. And of course the mouse wheel also works. Drilling down into a node of the tree can be done by double-clicking on a shape (or pressing the Down key on the keyboard). When you have reached the bottom of the hierarchy, further drilling will result in going back up to the root (alternatively by pressing the Up key). 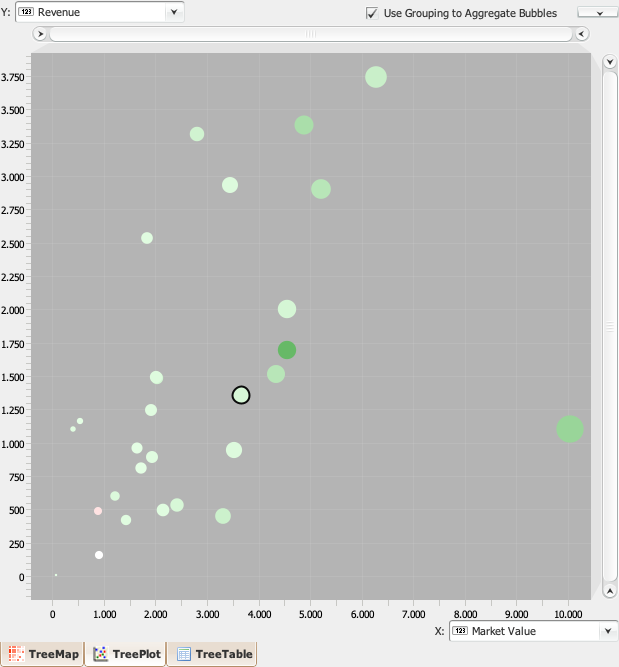 The TreePlot view allows you to create a scatter plot of the data. Any combination of numerical variables can be used to map to the x- and y-axes as well as size and color of the glyphs. 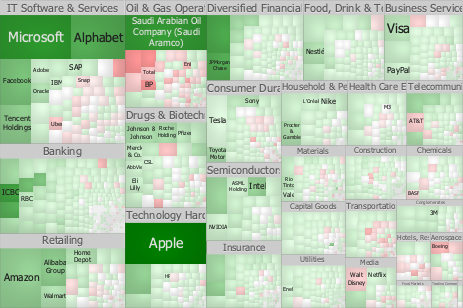 The color and size of the markers are determined the same way as for the TreeMap view, i.e. the definitions in the drop-down lists in the Configuration panel. When active, the items displayed in the TreePlot are the aggregate values according to the hierarchy defined under "Group by". Otherwise, the items at the lowest level of the hierarchy (i.e. the leaf nodes) are displayed. Drilling down into a node of the tree can be done when the "Use Grouping to Aggregate Bubbles" option is active by double-clicking on a bubble (or pressing the Down key on the keyboard). When you have reached the bottom of the hierarchy, further drilling will result in going back up to the root (alternatively by pressing the Up key). The TreeTable view is pretty straightforward. It simply shows all the active (not filtered out) objects in a traditional table format. If one or more variables are currently used for grouping, then the rows will be appropriately organized in a hierarchical manner, corresponding to the grouping chosen. Clicking on table column header will sort the column: the first click will sort ascending; the second click descending; the third click will reset the data to the original order. To sort on multiple columns, just press the Ctrl key and hold it down while clicking on the other columns. A number is displayed in the header to indicate the rank amongst the sorted columns. 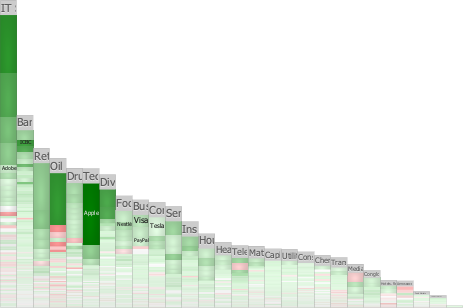 Selected rows in the TreeTable view will be displayed in the TreeMap view accordingly. If you would like to work with or highlight only a subset of the data, then you can use both the search function and the filters provided in the Filters panel. You can use the "Hide filtered" and the "Hide searched" check boxes to define whether objects that do not meet the criteria should be removed from the display or simply greyed-out. Reset will bring back the search and filters to their default configuration. The search function will look at every value and see whether it matches the given criteria. How the search is performed can be customized by using the drop-down list at the beginning of the field. For numerical variables, range sliders are provided that allow to define a given range that the value should be in. Click on the left or right end of the range slider, and drag it up or down to define the filter range. Double-click on a range silder to reset it to its full range position. The Details panel provides the possibility of seeing the actual values of the currently probed item. While probing, the value of each variable is displayed in the Value column. The Variables panel allows the customization of each of the available variables. It is possible to define how numerical and date variables should be formatted. Common formatting patterns include "0%" to display percentages, "$ ,#" to display currency amount and "0.00 hours" for timing information. See the section about Formatting patterns for a full description of the formatting patterns. Finally, one has the possibility of adding derived variables. To do so, click on "Add…​" at the bottom of the panel, give a name to the variable to be created, and enter an expression to define how it should be computed. Use for example "[Budget] / [Current]" to compute the ratio between the Budget variable and the Current variable. See the section about Expression language and functions for a full description of the language. You can customize the display of numbers, and TreeMap allows you to control the display of leading and trailing zeros, prefixes and suffixes, grouping (thousands) separators, and the decimal separator. You specify the formatting properties of numbers with a pattern. The pattern determines what the formatted number looks like. For a full description of the pattern syntax, seehttp://docs.oracle.com/javase/tutorial/i18n/format/decimalFormat.html#numberpattern[Number Format Pattern Syntax]. The pound sign (#) denotes a digit, the comma is a placeholder for the grouping separator, and the period is a placeholder for the decimal separator. The value has three digits to the right of the decimal point, but the pattern has only two. The format method handles this by rounding up. The pattern specifies leading and trailing zeros, because the 0 character is used instead of the pound sign (#). The first character in the pattern is the dollar sign ($). Note that it immediately precedes the leftmost digit in the formatted output. The pattern specifies the currency sign for Japanese yen (¥) with the Unicode value 00A5. In the preceding BNF diagram, the first subpattern specifies the format for positive numbers. The second subpattern, which is optional, specifies the format for negative numbers. Although not noted in the BNF diagram, a comma may appear within the integer portion. The contents of the pattern determines the format of the date and time. For a full description of the pattern’s syntax, see the tables inhttp://docs.oracle.com/javase/tutorial/i18n/format/simpleDateFormat.html#datepattern[Date Format Pattern Syntax]. Characters that are not letters are treated as quoted text. That is, they will appear in the formatted text even if they are not enclosed within single quotes. 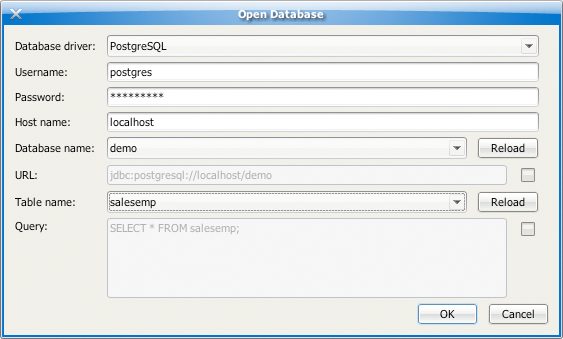 The language is based on a subset of SQL, the standard language for database queries. Below is the reference for the language, including literal types, data field references, basic operators, and included functions. The fundamental building blocks of the expression language, representing data values. The string null is parsed as an ObjectLiteral of type null. Free-standing strings or those placed within brackets are parsed as a reference to the data field of that name. Brackets are required for any fields that include spaces or other unusual characters in their name (e.g., characters like +, -, *, etc), or conflict with an existing keyword For example, true parses to a boolean literal while [true] parses to a reference to a data field named 'true'. Basic operators and control flow structures for the expression language. Groups expressions together to enfore a particular order of evaluation. For example, 1+2*3 evaluates to 7, while (1+2)*3 valuates to 9. Functions for performing mathematical calculations. Returns the nearest integer value greater than or equal to x. Returns the nearest integer value less than or equal to x. Functions for processing text strings. Capitalize words in the string`str`. Individual words/names will be given uppercase first letters, with all other letters in lowercase. Concatenate the input strings into one resulting string. Returns the starting position of the first occurrence of substring substr in the string`str`. Returns -1 if the substring is not found. When you open the resulting file (e.g. using File › Open…​), it will read all the data from the referenced data file and apply all the settings. You can also see how the settings are stored in the resulting .mtm file. It can be opened using any text editor. All the raster export format allow for setting the desired DPI for high-quality output. Using Edit › Copy Graphics: the current view is put into the clipboard in bitmap format (and can be pasted into applications such as Microsoft Powerpoint). The resulting document is ideal for 3D printing. It is compatible with Blender. The resulting document is ideal import into general purpose 3D editing software and further editing. Can be used for online previewing through any modern web browser. 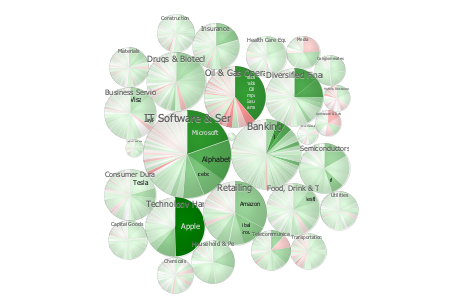 TreeMap can be invoked from the command line, typically for automating and batch processing the production of several treemaps. If you intend to use this scripting possibility in unattended and automated batch jobs (typically a night job running on a remote build server): non-human devices that utilize our software without user interaction are counted as users and you would then need to order the appropriate number of licenses. A typical usage scenario is to have some settings applied the data. To proceed, create a settings file (File › Export Settings…​ with the .mtms file extension) that then be loaded together with the data by specifying it with the --settings option . 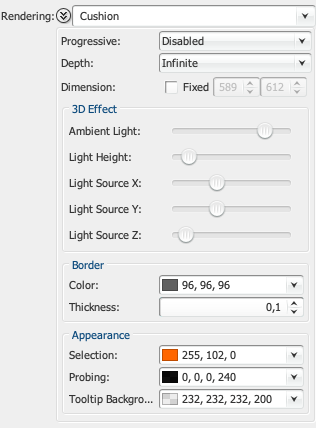 To be able to produce treemaps of arbitrary sizes, tick “Fixed” in Rendering › Dimension pane of the configuration panel and set the desired dimension.